In a very clear statement made by Mike Hooper, Chief Executive of the Commonwealth Games (CWG) Federation, the worm that has been infesting the CWG and other sporting mega events like the Olympics seem to have almost come out in the open. According to him, the Games’ organisers need to focus on issues that affect the athletes i.e., the Games Village, transport, security and smooth running of the actual sporting events. He said, “If you get those sorts of key issues right, then I think we have got a very good chance of the athletes at the end of the Games looking back and saying ‘we had a great time’. That is the target, that is the objective – the Games are for the athletes of the commonwealth.” And in doing so, he called for more responsibility (and thus power) to be entrusted to the Organizing Committee, the larger version of which, he’s an integral part. This post is dedicated to those who are not athletes but concerned citizens whose lives have been impacted by such Games and who often pay the price to watch others play with their rights. The post is also dedicated to the best Indian athletes who seldom get chosen by the selection committee and for whom, competing for the medal is a fight through a corrupt and unresponsive system. Mr Hooper’s statement can very well open a doorway to the black history of the Games and Sporting events held across the globe and driven by different reasons. “There will be issues, there were issues in Melbourne (in 2006)…things do happen, it’s making sure you have the mechanism in place to put it right…there are issues at every Games.” We cannot but fully agree to his wise statement. The most recently concluded global sporting event was the World Cup 2010 in South Africa. The organisers and the host country faced unprecedented oppositions and numerous protests were held against hosting the event. Slogans like “Get out FIFA mafia!” united thousands of South Africans who staged a march on June 16, 2010 protesting against lavish spending on the tournament and the sacking of security staff. While the country marked the 34th anniversary of the Soweto uprising against apartheid a large majority of its population still lives under poverty. Thousands of people marched in Durban to denounce FIFA and the Government for their wrong spending priorities. The Canadian Government faced tough resistance and challenges from people for hosting the Winter Olympic Games 2010. Hosted at a time when the country was going through economic hardship, it was accused of hosting such a big sporting event at the wrong time and spending unnecessarily huge sums of public money to host the event. The resistant was to such an extent that the Government had to set up a vast network of surveillance cameras at public spaces and barbwire fences and other barriers to keep protesters and the non-ticket holding public away from Games venues. Police were reported to have harassed and intimidated anti-Olympics organizers across Canada, in some cases visiting homes and workplaces to interrogate not only the Games’ critics but also their acquaintances. Another theme of the Vancouver protest was the deplorable conditions and ongoing violations of the rights of Canada’s Indigenous population, including those living in urban areas. 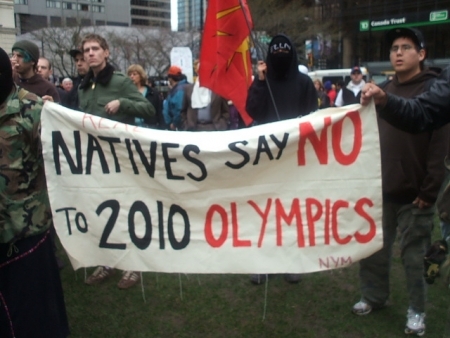 The Olympic Resistance Network (ORN) launched its work in Vancouver several years ago under the theme “No Olympics on Stolen Indian Land” highlighting the fact that much of the land on which the Games will take place was unceded Indigenous territory. Prior to 2010 Winter Olympic Games, the Beijing Olympic 2008 also faced similar mass protests and oppositions within and outside the country. The host country faced severe opposition and protests by Human rights campaigners as they held numerous demonstrations around the world including cities like London, Hong Kong, Delhi and Kathmandu. Demonstrators from Tibet, Zimbabwe, Sudan and Burma joined forces to protest against human rights violations and China’s hosting of the Olympics. In Delhi as many as 3,000 Tibetan monks and refugees shouting anti-Chinese slogans clashed with police as they braved heavy rains to protest next to India’s parliament. Going back to the history of Olympics, it was believed to be a display of male chauvinism and strength. A show of power and physical supremacy that promoted a spirit of competitions among different nations and states to showcase their power. Unlike Olympics, the Commonwealth Games dates back only to 1911, when a need was felt for organising an international sporting event in order to bring the colonies of British empire together. Starting 1911, the Games event was held as a part of the Festival of the Empire for celebrating George the fifth’s coronation. From its origin, to what it is now: the Commonwealth Games event has witnessed many changes. Known as the British Empire Games till 1950, the name was changed to the British Empire and Commonwealth Games. This was done mainly to recognise the sovereignty of those countries who became free and independent from the British dominance. The name British Empire and Commonwealth Games continued until 1966 when this event was organised in Kingston. The word empire was discarded later on and only British Commonwealth Games was retained. The event gained its current title only as late as 1978. With only 16 days left to go, CWG 2010 has already tasted many oppositions and faced angry mob protesting against hosting such an event in Delhi. 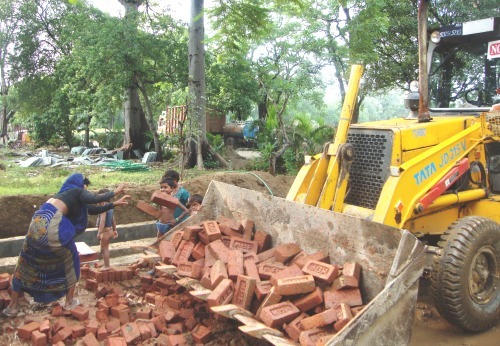 One of the first protests, against the construction of a Rugby Stadium by cutting down over 1,000 trees was initiated by the Delhi Greens organisation itself as long back as March 2007. The most recent protest that took place in the university was against the authorities asking the hostelers to vacate so the rooms can be used for family and friends of the OC. Recently, protesters in Uttar Pradesh raised slogans against the Queen’s Baton and burnt posters and an effigy of Shera, the mascot of CWG 2010. According to them, the Queen’s Baton is a symbol of slavery and has no meaning for independent countries. Many other protested because over 300,000 houses in slums were displaced in Delhi, and were not given any shelter by the Government. Many believed the money spent on the preparations for the CWG should have been spent on the country’s development, and in solving problems like the Maoists and militancy. As the organisers and Delhi Government run behind scheduled to finish the preparations for the Games, oppositions and protesters are all set and gearing up heavily to raise their voice. Human rights group have come to the forefront raising the plights of workers at the Games construction sites. The exploitations of workers and negligence towards their welfare especially health are ringing louder than ever before. Corruption that crippled many Games related work and lack of strong hands to put a check on such daylight robbery of public money and a shame to national pride are but a few issues that have strongly marred the country’s image. Even the funds being used for CWG 2010 preparation have been reportedly diverted from schemes for the upliftment of certain sections of the society. Undoubtedly we are still slave to many idealism and evils of society. It seems that democracy will now survive only in the voices and slogans raised against exploitation and injustice done to many for the gains of a few. It also seems good now that Delhi is not hosting the Asian Games 2014. For the sake of democracy and its justification, let the protests survive throughout the Games. May heaven and monsoon prolong the spirit of democracy and may all (not only the athletes) say “we had a great time” for their own different reasons and causes! There may be times when we are powerless to prevent injustice, but there must never be a time when we fail to register our protest.